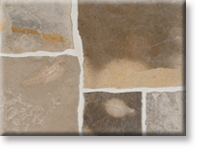 Description The Lompoc Gray Blend Ashlar Strip is a natural stone thin veneer in the standard oatmeal gray blend color with a snapped cut face, untrimmed ends, and saw cut on the top and bottom. It comes in various heights ranging from 1" to 4" and lengths ranging from 6"+ forming a horizontal random lineal pattern. It is usually laid dry with no mortar joints so please figure a little extra material if you are laying in a dry-stack type application. This can be laid with joints if preferred. This material is also available in corner pieces.